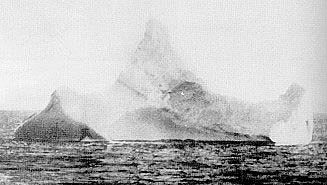 The idea of finding and raising the Titanic was thought of very soon after the sinking of the vessel. 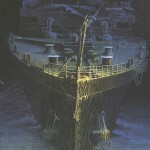 However, the first successful attempt at locating the Titanic Wreck was in 1985 by a French and American expedition led by Jean-Louis Michel and Dr. Robert Ballard. 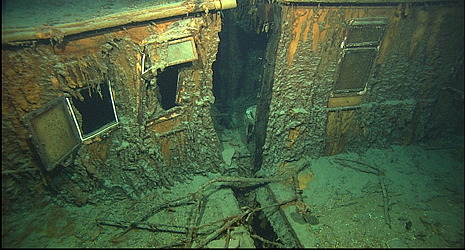 The Titanic wreck was located at a depth of 2.4 miles about 370 miles from Forgotten Point, Newfoundland, 13 miles from fourth officer Joseph Boxhall’s last position reading where Titanic was originally thought to rest. The fallen vessel was located using a side-scan sonar mounted on the vessel Knorr. Ballard returned a year later to conduct the first human dives in the submersible “Alvin”. 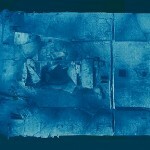 The expedition was funded by the United States Navy under the private conditions that the wreckage of two U.S. submarines by the names of Thresher and Scorpion were first discovered. 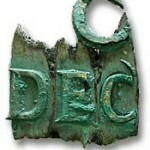 The Titanic shipwreck offered interesting facts and information about the sinking of the Titanic as well as artifacts from her watery grave. 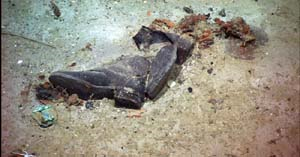 One of the main focal points of the wreck that scientists noticed was that the ship had actually split apart, contrary to what was popular belief. 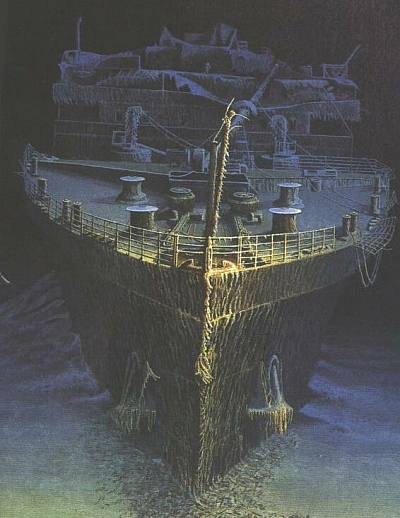 The bow was found 1,970 feet from the stern facing opposite directions which contradicted British and American accounts of the sinking of the Titanic. 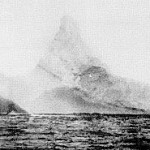 The bow was found to be in much better shape than the stern, as it was probably already filled with water before sinking. The bow is embedded 60 feet into the silt on the ocean floor, and although parts of it are under stress and ready to collapse, it is in relatively good shape. The stern likely had trapped air inside when it sunk, and therefore imploded in areas and received extensive damage upon hitting the ocean floor; the decks collapsed upon impact. 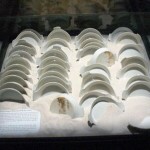 Many artifacts such as wooden (including french polished Mahogany) furniture, silverware, and dinnerware was found in the Titanic shipwreck while most of the softer material including carpet, human remains and, wood has been devoured by undersea organisms. 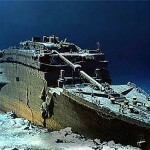 Dr. Ballard initially did not take up any Titanic artifacts as he considered this a form of grave robbing, but throughout history more than 6,000 artifacts from the Titanic wreck have been recovered. Among these is the ship’s whistle which was recovered in 1992 and has been operated twice using compressed air as opposed to steam due to its fragility. 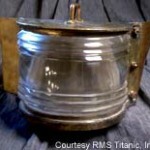 Most of the artifacts from the Titanic shipwreck are on display at the National Maritime Museum in Greenwich, England. 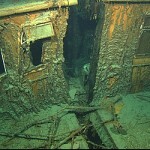 The current condition of the Titanic wreck is deteriorating and very unstable. Scientists estimate that the extra damage caused by tourists will cause the ship to collapse to the ocean floor within the net 50 years. most of the wood including the crows nest and mast have completely deteriorated. 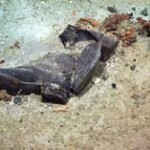 A legal battle has been ensuing over the ownership of the Titanic wreck as well as the artifacts pulled up, the largest being a 17 ton piece of the hull. Titanic Inspection Card – Photo courtesy of RMS Titanic Inc.
Titanic Deck Sign – Photo courtesy of RMS Titanic Inc.
Titanic Veranda Cafe Window – Photo courtesy of RMS Titanic Inc.
Titanic Running Light – Photo courtesy of RMS Titanic Inc.
Titanic Skylight – Photo courtesy of RMS Titanic Inc.
Titanic Shoes – Photo courtesy of RMS Titanic Inc.
Titanic Telegraph – Photo courtesy of RMS Titanic Inc.
Titanic Perfume Bottles – Photo courtesy of RMS Titanic Inc.
Titanic Toiletries – Photo courtesy of RMS Titanic Inc. 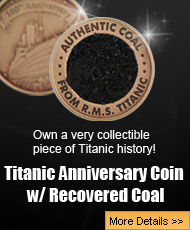 I love this site, and I get chills EVERY time I see the titanic shipwreck! I only wish I could go to pay my respects at the wrecksite! 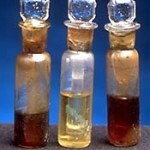 I cannot get enough of the history of the Titanic. What a terrible disaster due to the recklessness and cockiness of a few men. I am reading Shadow of the Titanic currently and ‘re-living’ it – 100 years later. he did say that even god cant sink the ship, but i dont belive he ment to sink the ship he was just proud of his work. it was allright when it laft belfast. 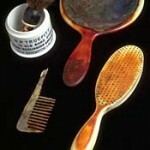 I’m facinated by the artifacts but do think that they should have been left alone like Bob Ballard wanted. 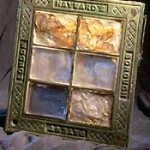 Changing the subject, does anybody know of a quality book on the artifacts of the Titanic? 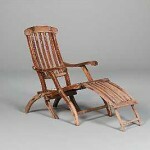 I went to the recent exhibition twice, and was gutted that there wasn’t one available. Any Ideas? wat do u mean andrew said tht not the capitan? wat are u talking about it was alright ? 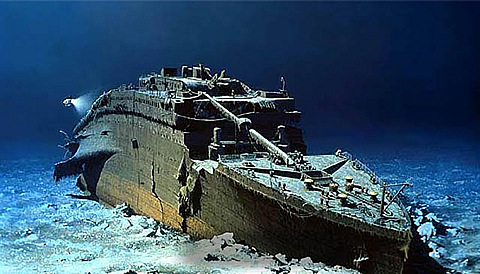 The Titanic was design to to stay afloat with only 4 of it’s watertight compartments flooded, and when it hit the Ice Berg, 5 of it’s watertight compartments flooded, therefore, the Titanic could not survive. 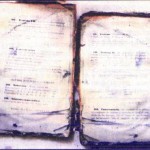 Do you know about this story… ? Wow . . . if this is true it is NEWS . . . do you have any more proof that the ship that sunk was an imposter? If so, what happened to the Real Titanic that was weeks away from being completed? Thanks for sharing that. There are researchers who have heard this story and I think that they would appreciate it if you could contact them and share whatever information that you can find for them in regard to your grandmother’s comments. You will find them under google search Titanic conspiracy One of the chaps is called Bruce. sometimes i dream about being in the titanic…and the feeling is odd…it even convince me that i’ve really been there that i am a reincarnation of one of the passengers…creepy but intriguing. As I would say the Titanic was very dramatic how they hit the iceburg and then saying goodbyes jumping off the ship very dramatic for me…!